Conrad Shawcross is the British artist behind three of the most high-profile public works unveiled in London over the past few years: Three Perpetual Chords, 2015, a series of knot-like sculptures commissioned for Dulwich Park, which draws from the artist’s ongoing study of harmonic ratios; Paradigm, 2016, a permanent installation at the Francis Crick Institute’s biomedical research centre in King’s Cross, which is currently the tallest public sculpture in central London; and the 50-metre-high The Optic Cloak, 2016, a major architectural intervention for the Greenwich Peninsula low carbon Energy Centre, a synthesis of engineering and optical research that draws on subjects including maritime camouflage, Cubism and Op Art. 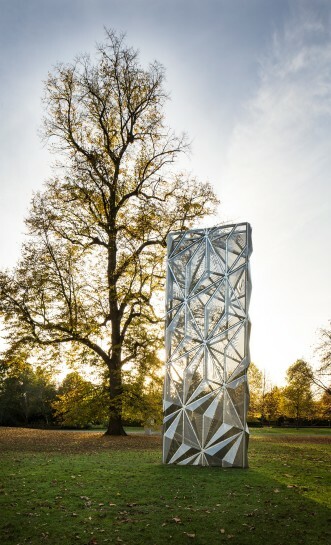 Monolith (Optic), 2016, which was selected by Clare Lilley, Director of Programme at Yorkshire Sculpture Park, for Frieze Sculpture Park 2016, and is currently on view at New Art Centre, Roche Court, appears to change endlessly according to shifting light conditions. Shawcross tells us about his ideas for the work and the technology behind its shimmering surface. How did you achieve the optical effect of Monolith (Optic)? What is the connection to camouflage? Do you think it will influence the development of your work? Just as works such as Paradigm contain an idea of movement in stasis, the surface of Monolith (Optic), which appears constantly to move and shift, plays with received ideas about the static and monumental. How does Monolith (Optic) relate to The Optic Cloak in Greenwich? You’ve made some of the largest public works in recent times. Do you still like to get hands-on in the studio with small scale works. The combination of science and poetry in your work seems key. Do you think of these as conflicting impulses, or do they come from a similar place? Monolith (Optic) is currently on view at New Art Centre, Roche Court, near Salisbury, Wiltshire.